Cant explain how good the atmosphere was at this hostel. Perfect balance of chill and social/party. Literally 2 min walk to the beach, they also do daily tours around the island. Staff are all fantastic, special shout-out to Ashley for being great fun & company to everyone even when she’s not working! Definitely recommend staying here. Rooms are good and free waffles & breakfast! 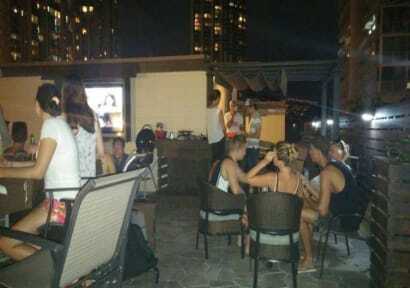 The rooftop common area is perfect, met some of the best people ever on this trip. Thanks guys for a fantastic stay. Handy for the beach and the H1 highway. Nice people, not expensive but good value for money. Very comfortable bed and good shower. Only potentisl drawback is the shared shower and WC, but we rarely saw the others, so a non issue. The atmosphere was great and friendly, perfect for a 20-35 singles or couples. I really enjoyed my stay at The Beach! The hostel was very clean and conveniently situated to the beach and Diamond Head. They also provided shuttles which only required a $10 tip for the driver ($10-$30 depending on the excursion) and went to various amazing locations on the island. Highly recommend staying here as a solo budget traveler, especially without a car! Wonderful stay!! The common area of our private room was cleaned really well everyday. Breakfast was ok, would be nice if they added hard boiled eggs or something different. Free pizza on Friday was awesome! Was really nice to have the free beach chairs and mats to use on the beach. The staff was all really nice. Great spot — I was upgraded from a 4-bed (which I chose because it was all that was available) to a nice 2-bed dorm, part of a three room suite that had it's own bathroom, separate shower, refrigerator, and living room. Very comfortable! The rooftop lounge and other hangout areas were nice as well, and just a few blocks from the beach. I had a wonderful time at the Beach boutique hostel. The people I met there was the best part, but also the activities the hostel proposed and pizza night were everyone come together were excellent. Thank you and I will definitely come back! We had a great stay at this hostel! Was a fantastic location so close to the beach. The hostel offered a lot of activities, surfboard hire etc which was great. However, there were a couple of times where we asked staff for advice and they were unable to assist. For example, we asked what the best way to get to Diamond Head for the hike was after seeing a couple signs around the place and the guy at front desk ummed and ahhed and eventually just said "yeah I don't actually know". Great place to stay. Excursions are probably the highlight of this place as they have something going on every day. Amazing location. Downside: 1. Staff not very lenient as compared to other more friendly hostel staff. 2. Breakfast from 8am-9am -- out of 7 days that I was there, only ate there once as I was out before 8am. 3. Everything has a cost. Not many complimentary items. Bare minimum 4. Cleanliness: bathrooms get a quick wipe down daily but the rest of the room is quite dusty.